We sat at dinner tonight after the kids were in bed. It had been a long day. Many things had gone wrong. (And many had gone right.) You know the kind of day. I was tired, but thankful to be eating a dinner that my husband made. And then all of a sudden I burst into tears. Because my baby is turning two tomorrow. Mah BAY-beeeee. How did this happen? How has it already been two years? When. did. he. get. so. tall??? No one has had such a dramatic impact on my life as this guy has. The day he was placed in my arms changed me forever. He turned my life up-side-down, and then right-side up again. Happy birthday to my baby, my big boy, my precious firstborn son. And happy birth day to me. And because I’m all mushy and sentimental, would you please humor me and just look at how much he’s changed since last year? WOW! Seems like a week ago he was born, then yesterday he turned one… Time flies! Happy birthday Levi! Happy birth day Mommy! I love both of these pictures and the accompanying words! No, I don’t think birthdays will ever get easier. I imagine I’ll always cry, feel sentimental, but also wildly excited and thankful for the years gone by. Happy Birthday to you both! Happy Birthday! I am hoping that they get a little easier… but betting they don’t. and happy birthday to the monster! so glad we can trek together through our blogs!! 2 is such a fun age. Actually probably my favorite among the toddler years. 3 is much more, um, trying, so you’ve got a good 365 days before you’ve got to worry about that! HAHA. Happy birthday to your little big guy! yeah, i’m really loving this age! despite the sometimes STUBBORN independence, he’s just so hilarious and smart and cuuuute! It all goes by too quickly! I loved the speech explosion – our daughter’s vocabulary just rocketed off and it’s made everything all the more entertaining, helpful, and fascinating. You will love it! 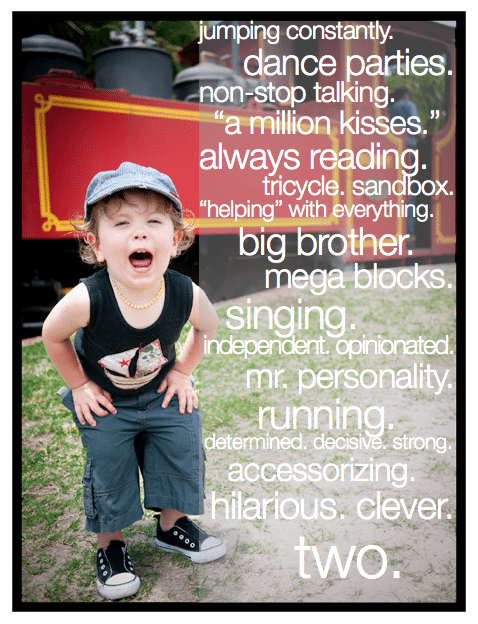 Enjoy celebrating your big boy’s big day! thanks kirsten! i’m loving the beginning of the speech explosion, but i don’t think we’ve really hit it yet. lots and lots of words… but still lots of mumbo jumbo too! it’s a very fun/exciting time! Happy Birthday, sweet boy! Happy 2nd anniversary of mamahood, sweet mama! Awwwww Happy bday to your sweet boy! He’s adorable! My son also just turn 2 this month! I just found your blog and love it! Happy happy birthday Levi! I love the annual photo you used, as well as all the adjectives. It’s a really sweet way to commemorate. As for Georgia’s third year, I’d have to say my favorite part was watching her sense of self develop. She started to have this independent streak, this fierce command over her own abilities. It can be frustrating sometimes, but it’s absolutely amazing to watch. I am a little late to the party (as usual), but these photos are so awesome! I need to go back and do this for last year and remember on this bday! 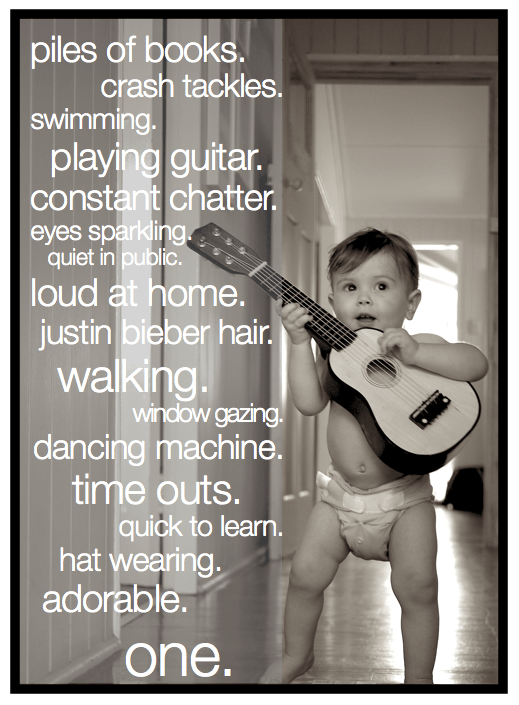 Hi…how did you place your baby’s photo on the pic with the poem…that is so clever…thanks! How did you do that with the words on the pics? Mah bay-beees are turning twoooo next month and would love to do this for them.